“Busy!” He planted his axe in the giant’s foot. “Milk. Now,” said Helga, slamming the shutters closed. “In my foot,” said the giant. But wait! What? That’s it!? What about Wolfgang? What about his axe? What about Helga and that baby? Will Wolfgang get the milk or will the giant squash him? I need to know! So, that’s NOT it, my friends… YOU are challenged to pen the ending to Joe’s story. Be funny, be epic, be gritty, or romantic. Whatever you do, be creative. The story is yours! 1. You have 1 week to post your entry. The contest closes at 7am on May 1. 5. The judges will be looking for creativity, good dialogue (this did start as a dialogue post after all), and a compelling/satisfying ending to the tale. 8. A first place prize and a runner up will be awarded, with first place winning a first page critique of your manuscript by me and the runner up getting a book on the craft of writing (I’ll make sure it’s something you don’t already have). 9. The winner & runner up will be announced on Wednesday, May 8. So, have at it! Let’s see what you come up with. The fate of the milk, axe, and our Vikings is in your hands. I can’t wait to see what you come up with. **If you are one of my clients you can enter for fun but you are not eligible to win one of the prizes. Hair sprung from the giant’s ear like the quills of a frightened porcupine. Globs of reddish-orange earwax clung to the hair, and puss oozed from underneath a scab the size of a well-fed badger. Wolfgang needed no further invitation. He charged, plunging his axe into the giant’s ear. “Almost have it,” Wolfgang said. 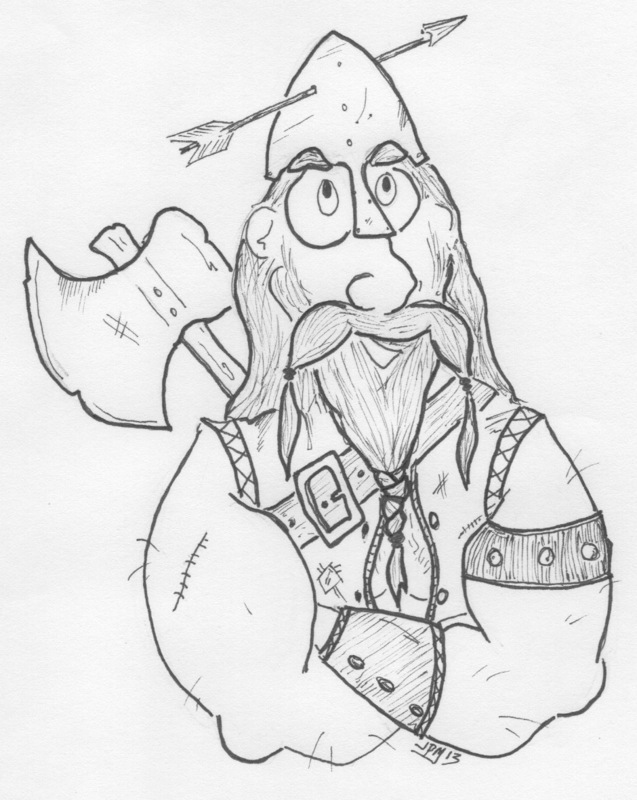 He charged again, his axe bursting through the eardrum and gouging into the giant’s brain. The giant shuddered once. Twice. Then lay still. Suddenly, something smashed against the back of Wolfgang’s helmet, knocking him to the ground. He rolled onto his back and looked up. Wolfgang heaved himself up from the road and sighed. Wolfgang watched the giant run into town, crushing fences and smashing carts as he went. Wolfgang ran past everyone, heading straight for the farmer’s stand. He snatched up a couple bottles of milk and made a dash for the baker’s. He had to duck to avoid a flaming cart of hay. He grabbed a loaf of bread and ran towards where he last saw the giant. Now came the hard part: he had to kill him. He was known as one of the best warriors, and he couldn’t let his reputation suffer, especially not because of a bottle of milk. When he saw him, though, he stopped in his tracks. The giant was sitting on the ground, surrounded by the townspeople. He was crying, while being comforted by the women. “I just don’t know how to tell them,” he sniffled, blowing into a bale of hay. “I don’t know how my parents will react when they find out I’m a vegetarian,” he sobbed even louder. Wolfgang heard murmurs of encouragement from the women, and even a few of the men in the crowd. This day just kept getting weirder and weirder. The giant lifted his beefy foot (the one without the axe in it), and Wolfgang pulled out his knife. The knife left very little impact on the giant’s tough foot as Wolfgang was squished flat. “You!” said Helga, snapping the shudders open. “Deal with me?” the giant asked in great confusion. “If you do not get me milk within the next hour, you will be the one sitting up all night with a squalling baby. We’ll see how you like it,” she said, slamming the shudders shut with extra umph. “Yes, ma’am,” the giant said, and he went off to find a village that Wolfgang had not raided. Helga smiled her brightest smile up at the giant as she took the big bottle of milk from him. It was the same smile Helga had used on Wolfgang, years ago. Baby Wolfgang gurgled and grinned and reached one tiny hand out to the giant. “Er, I’m sorry about all that,” Erik said with a vague wave in the direction of Helga’s squished husband. Helga murmured down at baby Wolfgang and tickled his chin as she got his bottle ready. “About what?” she asked. “You weren’t going to abandon a widow and her baby were you?” Helga asked, hand on her hip. And so Erik made a giant longhouse for himself next to Helga’s much smaller longhouse. Erik kept away the other raiding Vikings and always brought home milk for baby Wolfgang. And sometimes Helga was rather hard to take, but little Wolfgang was made it all worthwhile. Erik loved him like a son. “Understandable?” The giant’s, well, giant eyebrows went up on his enormous forehead. “You’re not even going to fight back? Maybe thrust your elbow into my ankle? That does sting more than you’d think it would.” He gave Wolfgang an encouraging smile. Wolfgang tried out his best aggressive face, but all he could think of was Helga, the baby, and the last words she spoke to him before slamming the shutters in his face, and the only expression he could conjure was one of complete and utter sorrow. Wolfgang shrugged. “I guess,” he mumbled. They stared at each other for a good long moment. “My wife needs milk,” said Wolfgang. “Well…” It did sound awfully silly, now that the giant was saying it out loud. “It’s not just the milk. Lately it’s all, ‘Wolfgang, we need milk.’ ‘Wolfgang, the baby needs changing.’ ‘Wolfgang, the kitchen has rats again.’ She needs all these things from me, but never just me.” Wolfgang’s whole body seized up then, at this sudden realization. “Don’t worry about it.” The giant stood back up and lifted his foot once more, feeling, for the first time in his life, a sense of satisfaction that he’d been able to help someone instead of just squashing them with his foot. And he was too busy giving himself a healthy portion of self-congratulations to notice Wolfgang pull the axe from his other foot and throw it into his neck. The giant, as predicted, fell to the ground, creating a small earthquake. Once Wolfgang recovered, he stood up, dusted himself off, and walked back to the house. Helga was bouncing the baby on her knee as he walked in. “Did you get the milk?” she asked. He didn’t answer. Instead, he walked straight up to her and gave her a kiss rivaled only by the one he gave her on their wedding night. “I love you,” he said as their lips parted, and he made sure they were the truest words he ever spoke. The cow’s name was Olgathor. Wolfgang approached and the cow adjusted her stance. “With my axe?” Wolfgang said, frowning. Muttering under his breath, Wolfgang walked into the giant’s garden and began to chop away at the thick vines. As the afternoon drew to a close he pushed the vines onto the giant’s compost pile and then loaded the beans onto a sledge, which he pulled down the dusty road towards the market. Halfway there he passed a crossroads where a young man was coming from the opposite direction, leading a cow. He waved at the man and hurried over to him. “Hey, lad, you headed to the market?” he asked. “I suppose you’re right,” Jack said, scratching his head. Jack looked at the sun hanging low in the sky. “I suppose,” he said. “Good man,” Wolfgang said, and reached out to shake Jack’s hand. “I’ll throw in the sledge for free,” he said, and began to lead the cow back to his house. “Woo goo,” the baby said. The seams on his jumper stretched and then tore as he grabbed one of the horns on Wolfgang’s helmet and then hit Wolfgang with it. “Honey, are you all right with the baby for awhile? I need to go see the smith,” Wolfgang said. Wolfgang tried once more, but the axe wouldn’t budge. “Alright, now what?” He looked up at the giant. “Now I squish you.” The giant reached towards him, massive finger and thumb poised in the classic bug squashing form. Wolfgang did the only thing he could think of, he bit the giants thumb. “Not now dear, can’t you see I’m negotiating this behemoth’s surrender?” Wolfgang waved a dismissing hand in Helga’s direction. “My surrender?” The giant bellowed, the volume of his voice shaking the ground. “Yes, indeed. Now if you lie about here… and hold your head thusly.” Wolfgang craned his head back in example. Wolfgang and the giant replied in unison. Once they were close enough, the giant’s face looming large, Helga’s arms flashed out like lightening. She grabbed Wolfgang’s earlobe between finger and thumb with one hand while the other grabbed a fistful of the giant’s earlobe causing the two to grimace in pain. With Helga’s scream still echoing in their ears, the giant and Wolfgang scrambled through the mud to a nearby barn. The giant ripped the roof off and reached inside, plucking out a cow. Wolfgang fetched a pail and waited. The giant squeezed the cow. Several hours and a whole herd of cows later, they had a bucket of milk. Helga and the giant lived happily ever after. Well at least according to Helga. Wolfgang stared at the giant. The giant stared back at Wolfgang. Wolfgang spat on his hands and gripped the axe handle tightly. The giant pulled a pair of tiny spectacles and a book out of his dingy vest’s pocket. Wolfgang stared up at him, mouth agape, the axe forgotten. Wolfgang looked at him blankly. Wolfgang blinked. He frowned. He grabbed the axe again and yanked. The giant rolled his eyes and went back to his book. Meanwhile, Helga wrapped little Ansgard in a tight swaddle and strapped the babe onto her chest. She picked up her halbard and left their hut. She walked unnoticed right past her husband and his prey. Ansgard rolled his bleary eyes. Back at the battle, Wolfgang freed his axe with a single great jerk and a whoop of triumph. He raised the axe high above him in a solid two-handed grip and grinned at his foe. Wolfgang groaned. He sat down on a rock and waited. That was no good; his body raged with adrenaline and he could not sit still. He got up and practiced some new forms with his axe instead. This took several minutes, so when he was finished Wolfgang turned to face the giant again with his axe held high. The giant was still reading. The giant twitched and looked down. Wolfgang whirled around, his axe swinging wildly. He stopped when his axe was blocked by a halbard. He followed the hand on the other weapon up the wielder’s arm until he recognized his own wife. Helga raised her halbard and brought it down squarely on Wolfgang’s (un-helmeted, she always warned him about that) head. He fell unconscious to the ground. She tucked her halbard under her arm with the skein of milk and walked back to the hut. The giant leaned forward and picked Wolfgang up between his forefinger and thumb. The giant laid Wolfgang on the ground, gently placed his good foot over him, and leaned over to pick the loosened axe from his other foot. He lifted his foot. “Oh dear,” he said. He poked a forefinger into the mud, searching for the submerged Viking. Finding a leg, he gently pulled him free, and laid him in his palm. “Ere you. Giant. What you done with my Wolfgang?” said Helga. “What do you want me to do with him?” the giant said. The giant laid Wolfgang’s body on the ground at Helga’s feet. “What you going to call him?” The giant reached out and chucked the child under its chin with the very tip of his little finger. “You could let go of the axe and run,” the giant suggested. “I hadn’t considered that,” Wolfgang admitted. “Why the baby?” Wolfgang asked. “Squash him already,” Helga shouted. “Nice lady,” the giant said. “I heard that,” Helga hollered from inside. She followed it up with some indecipherable muttering. “You’ve given me a headache,” the giant grumbled. He extracted the axe from his foot. Helga ran from the house with the baby cradled in one arm. “Gimme that axe,” she demanded. The giant hesitated long enough to elicit a string of curses from Helga. “What did I tell you?” Wolfgang’s remark earned him a powerful slap upside the head from his wife. 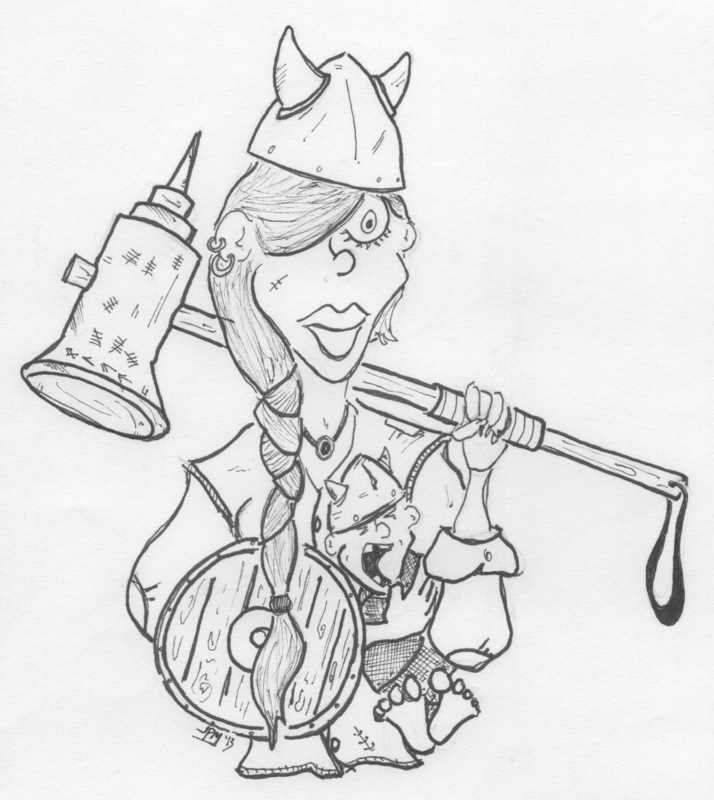 The giant chuckled and handed her the axe.